The Mind-the-Store Campaign has realized significant victories towards its goal of pressing the nation’s largest 10 retailers to phase out toxic chemicals. Some of the nation’s largest retailers such as Home Depot, Lowe’s, Walgreens, Target and Walmart, have all made announcements to eliminate toxic chemicals from their stores. However, the details of these new plans and policies are often undisclosed to the public. Suppliers have also been known to find substitutes that may be somewhat safer than the targeted chemical of concern, but which display other hazardous health effects. Read more here. 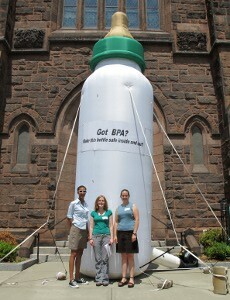 The Massachusetts Department of Public Health banned toxic BPA in baby bottles and cups, making Massachusetts the 8th state to do so. This is an important step, but only a part of what is needed because it still leaves infants and toddlers vulnerable to exposure to the toxic BPA in infant formula and baby food packaging. 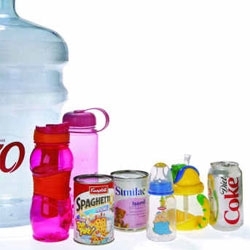 It also does nothing to reduce exposure to pregnant women, problematic because a significant time for concern about BPA exposure is during fetal development. Massachusetts Department of Environmental Protection Commissioner, Laurie Burt, joined forces with officials from twelve other states to dictate a set of eight guiding principles to be used for reform of the Toxic Substances Control Act (TSCA) -- a law from 1976 which provides the EPA with the authority to regulate toxic chemicals. Governor Patrick issued Environmental Purchasing Executive Order to buy Preferable Products and services. The Massachusetts state agencies will be using their purchasing power to purchase products and services that are less toxic and more environmentally sustainable. The executive order directed the executive branch office and agencies to "...reduce their impact on the environment and enhance public health by procuring Environmentally Preferable Products and services (EPPs) whenever such products and services are readily available, perform to satisfactory standards, and represent best value." Massachusetts Department of Public Health (DPH) issued a consumer warning for pregnant women to avoid products containing BPA. The Massachusetts Department of Public Health (MDPH) announced new regulations banning the manufacture, transport or sale of children's jewelry containing a concentration of lead that either is more than 600 ppm total lead content, or that would expose a child to greater than 15 ug (micrograms) of lead per day over a chronic exposure period. Later in 2008 a federal law was passed that preempted the state regulation, and the action by MDPH helped set the stage for what was later done at the federal level. The Mercury Products Bill was Signed into Law by Mitt Romney after a six year campaign by Clean Water Action. An Act Relative to Mercury Management is among the strongest of an increasing number of state laws across the country that will dramatically reduce emissions resulting from the use of mercury-containing products. The bill will phase out the use of certain mercury-containing products that have safer alternatives and will require manufacturers to set up collection programs to keep discarded products out of the waste stream. In July of 2005 the Legislature allocated $250,000 to the Toxic Use Reductions Institute (TURI) at UMass to assess the safety, and feasibility of alternatives to major uses of five widely used toxic chemicals. The study was completed in July 2006. The results served as a call to action for lawmakers to pass An Act for a Healthy Massachusetts: Safer Alternatives to Toxic Chemicals in the 2007-2008 session. "The Safer Alternatives Bill" will encourage companies to use safer alternatives to toxic chemicals, whenever the alternatives are available and feasible. "We overrode a veto by Governor Romney and authorized funding for this study because we saw the need to prevent health damage caused by toxic chemicals," said Representative Jay Kaufman (D-Lexington). Methylene Chloride, which has been linked to increases in liver and lung cancer.